Further information from the Company�s latest informative release, The Market for Military Satellites, finds the U.S. military satellite dominating the market over the next decade, based on the country�s vast financial capabililties to meet the requirements anticipated for the transformational process. Plus, high-priority reconnaissance and defense programs are already underway within the United States. FI also expects the ongoing trend of consolidation of European nations� satellite efforts, combined with increased military use of civil remote-sensing systems, will limit production opportunities in that region. The analysis projects military satellite production in Europe, Japan, and Israel will account for 27 spacecraft, representing approximately 28.4 percent of the market covered in the report. In terms of value, production in those regions is expected to be worth $5.2 billion, or approximately 17 percent of market share. Among notable indicators, in the United States, over $5 billion in military satellite production scheduled for the forecast period has yet to be contracted. Additionally, the massive GPS and Transformational Communications programs currently underway in the United States will provide a comparatively cushy fiscal pillow to fall back on during the current commercial downturn for local manufacturers such as Boeing, Lockheed Martin, and Northrop Grumman. �In terms of unit production within the United States, Lockheed Martin outpaces its competitors as the number one military satellite manufacturer in the world over the next 10 years,� said John Edwards, Forecast International senior analyst and author of the study. "Lockheed Martin is building the Advanced EHF constellation GPS III, the U.S. Navy�s Mobile User Objective System, and the SBIRS High system." The United States enjoys an advantage in the military space arena second to none, according to the FI report, and accounts for nearly 90 percent of global military space spending. �This lack of balance in the world military satellite inventory and in military space capabilities as a whole is driving this dynamic market, and therefore the militarization of space will continue to be a vigorous and lucrative market.� Edwards said. Unlike the market for commercial systems, military markets are less exposed to risk when it comes to the ebb and tide of the consumer, which in this case is the military itself. �Therefore, manufacturers of these systems - especially in the United States - can look forward to a strong military satellite market over the next decade,� said Edwards. The CEO of Globecomm, David Hershberg, reveals his firm has succeeded with a $23 Million U.S. contract with NATO to supply force tracking equipment. Additionally, Globecomm is one of six contractors selected to participate in the U.S. Army�s $5 Billion U.S. Worldwide Satellite Systems Program (WWSS). The Defense Communications and Army Transmission Systems and the Warfighter Information Network-Tactical Program jointly manage the WWSS out of offices located in Ft. Monmouth, New Jersey. �Globecomm will bring government agencies turnkey commercial satellite systems and associated support services for satellite terminals, including all hardware, software, field support services and technical information,� added David. The company is exploring the possibililty of an acquisition in Europe to increase their European sales. Howard Hausman, the President of MITEQ, believes �The military satellite business continues to change, improving capability, reliability, and cost per bit. As an example, in the past few years major changes have occurred in the availability of L-band Modems, which, when employed, alter the configuration of the respective Satellite Earth Station. Interfacing with the L-band modem is a single conversion Block Frequency Converter instead of a dual conversion device. MITEQ produces both types of converters and continues to support our customers using either technology. When asked about some of the advances this market segment could experience in the next year or so, Hausman replied, �The ability to adapt to flexible missions is a key necessity for successful military operations. To support these missions, companies such as ours are looking into integrated microwave subsystems and more compact packaging techniques for easier transportability and faster set up of Satellite Communications equipment. There are the usual challenges to overcome. MITEQ�s CEO said, �Bureaucracy, time to deployment, and funding are challenges that must be overcome to meet the communication needs of the military, but the major challenge is sustaining an industrial capability in an increasingly competitive international market. Military forecasting, longer term contracts, and customer support will help our industry maintain a capability to react to changing military requirements.� MITEQ has made the commitment to maintain a flexible production capabilities while ensuring close communication with their customers to make their mission easier and more reliable. Numerex� satellite division, Orbit One, uses their satellite technologies for mission critical military and commercial applications, entering this market as resellers of commercial technologies. Their initial applications encompassed general field logistics capabilities, which quickly led to the development of tracking solutions specifically tailored to a variety of industries that ranged from cargo tracking to defense logistics. Michael Maret, the Executive Vice President and Chief Operating Officer of the company, offered some insights into his company�s operations and plans. �We launched the SX1 satellite tracking tag in September 2007 as a direct result of real world perspectives gained during our direct dealings with the emergency response and military industries. Building upon our commercially developed tracking device, we incorporated additional features to meet the highly specialized needs of disaster recovery organizations. Agreeing with Howard Hausman, Michael added, �Time to deployment and funding are two key challenges to any new implementation in government agencies, and were the contributing factors we considered while developing the SX1. This solution can be installed, activated, and operational in less than one minute, with the ability to track and monitor any asset from continent to continent nearly instantly. The complexities of the military satellite world can be confusing, due to the heavy reliance on acronyms, procurement policities, and bureaucracy. To make sense of these channels of operation, a number of seminars, sessions, conventions and trade shows specifically orient themselves to parsing this information to those interested in this expanding industry. One such leading show happens to be the Global MilSatCom 2008, described as the European hub for Military Satellite Communications. The show is celebrating its 10th Anniversary this year. This is a great venue for assembling with leading milsatcom nations to discuss national developments, international cooperation and learn all about current operational challenges. Attend key presentations and determine which of your company�s solutions can provide our warfighters with the technological products required to ensure their missions are successful. You�ll also be able to analyze the latest European, U.S., Astralian and UAE national programs to determine how best to supply their needs. Other key areas include the ability to directly engage with decision makers and leaders from 20 countires... absorb information about the latest technological advances from industry leaders and then benchmark them against military ops experiences... learn about future technologies and how they will impact current ops... delve into policy frameworks and procurement strategies... and learn about Satcom on the Move as well as SatCom on the Halt. Global MilSatCom will also be presenting associated events, such as Understanding Ku- and Ka-band and SATCOM-on-the-Move Antenna Systems. If the success of SMI�s 2007 exhibition is any indication, MilSatCom 2008 will be bigger and better! Select the conference logo for further details. 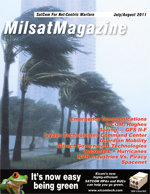 I have compiled more information on a number of conferences occuring this year that possess a MilSatCom focus � this content may be read in a later article in this issue of MilsatMagazine. Actel Corporation has added new ProASIC3 and ProASIC3EL FPGAs (field programmable gate arrays) to its military-qualified product offerings. Verified to operate across the full military temperature range (-55 to +125 degrees Celsius) and ranging in density from 600,000 to 3-million system gates, the new low-power devices are immune to neutron-induced configuration upsets (�firm errors�), saving board space and minimizing complexity in the system, Actel officials say. A new report from ASDReports entitled Military Communications and COTS 2008 describes both the technologies and the relevant markets in detail, with pertenent data and informed opinions and is valuable to both defense procurement operations and to relevant technology providers. BBN Technologies has been awarded $8.9 million U.S. in funding by the Department of Defense�s Defense Advanced Research Projects Agency (DARPA) under the third phase of its Disruption Tolerant Networking (DTN) program. This latest award follows BBN�s successful completion of Phases One and Two, which resulted in a working prototype system. The Boeing Company [NYSE: BA] has completed a US $10 million, 20,500 square-foot satellite Mission Control Center (MCC) in El Segundo, California. The MCC can manage as many as four commercial or government satellite missions at the same time and replaces another Boeing facility in El Segundo that was smaller and had limited capacity. The U.S. Air Force is expected to be the first customer of the new center and will use it to manage an element of the military�s Wideband Global SATCOM (WGS) mission. Boeing is currently manufacturing satellites for the WGS mission, the Global Positioning System, and the Space-Based Space Surveillance system. CAP Wireless, Inc. has announced the debut of their CHPA0618-1 ultra-broadband power amplifier for broadband military platforms within the defense electronics and homeland security industries. The unit incorporates gallium arsenide (GaAs) monolithic microwave integrated circuit (MMIC) technology into CAP�s patented Spatium� broadband spatial combining architecture. DataPath, Inc. has been awarded $1.7 million to provide field services support for the Ramstein Air Base satellite communications teleport operated by the U.S. Air Force. This funding continues DataPath�s support of the Ramstein teleport and is from exercised options on an existing delivery order. The teleport is a vital Defense Information Systems Agency (DISA) hub for military communications and links military X-band networks with commercial Ku-band networks to enhance overall bandwidth capacity and provide network-centric, high-bandwidth capabilities to U.S. forces. DataPath installed the teleport and has supported it for seven years. DataPath, Inc. has also been awarded $1.9 million to continue providing field services for DataPath Deployable Ku Band Earth Terminals (DKETs) at a key communications hub in Iraq.The DKET systems were built and installed by DataPath and are used by the U.S. military as critical satellite communications (SATCOM) hubs that deliver high-bandwidth capabilities on the battlefield. L-3 Electron Technologies, Inc. (L-3 ETI) has debuted their model 8923H dual-band 300W 30 GHz / 175W 45 GHz Traveling Wave Tube (TWT) amplifier. Designed for military SATCOM uplink applications, the new TWT has a remarkably small footprint and weighs less than four pounds. L-3 ETI�s model 8923H TWT operates over the 30 to 45.5 GHz frequency range, including the 33 to 36 GHz radar band, and incorporates focus electrode modulation to allow CW and pulsed operation. Newtec�s Tellitec� IP software product TelliNet has been selected by satellite broadband supplier ND SatCom to be integrated with the SkyARCS platform to provide fast and secure Intranet access via satellite to the Bundeswehr (German Federal Armed Forces). ND SatCom Defence is the main supplier of military satcom solutions to the German Armed Forces. Coming to NASA�s Wallops Flight Facility, Wallops Island, Virginia is a first � the Tactical Satellite-3 mission is scheduled to demonstrate rapid data collection and transmission to the combatant commander in the theater of interest. During this upcoming flight a new capability will be demonstrated and tested; that of employing a hyperspectral imager with a space-based, onboard processor to obtain and send images within minutes to the warfighter on the ground. Raytheon constructed the Advanced Responsive Tactically Effective Military Imaging Spectrometer, or ARTEMIS, hyperspectral imager. A landmark announcement by the U.S. Air Force and the State of Florida today states that they will fundamentally expand the state�s position and prominence in aerospace and the space industry in all three key sectors: civil, military, and commercial, thereby broadening participation in space-related activities. Launch Complex 36 at Cape Canaveral Air Force Station, subject to completion of the environmental impact analysis process, will be re-built as a multi-use vertical launch complex capable of supporting several launch vehicle configurations ranging from light to medium-lift into low-Earth orbit and beyond. ViaSat Inc. received a $9.3 million U.S. award from the Defense Information Systems Agency (DISA) to continue the development of the UHF SATCOM Integrated Waveform Channel Controller. This second phase of the Integrated Waveform (IW) development enables demand assigned services on UHF SATCOM networks to support new applications that require better performance and higher channel throughput. IW, a requirement of the Department of Defense (DoD) Standardization Program, is designed to prolong the life of the UHF Demand Assigned Multiple Access (DAMA) SATCOM System through a series of network upgrades. iDirect, Inc. , a subsidiary of VT Systems Inc. (VT Systems), has launched its Series 12200 Universal 4-Slot Industrialized Hub, which allows network operators to implement and manage a mobile satellite network in the field. The new 4-slot hub will operate using iDirect�s enhanced iDS 8.3 software, engineered for use in mobile applications. Additionally, TigrisNet, a UK based global provider of IT solutions and satellite communications, has installed an iDirect Series 15000 Universal Hub and 50 Evolution X3 Satellite Routers to power an enhanced DVB-S2 network with Adaptive Coding and Modulation (ACM) for corporate and government customers in Iraq and the Middle East. iDirect is a world leader in satellite-based IP communications technology.